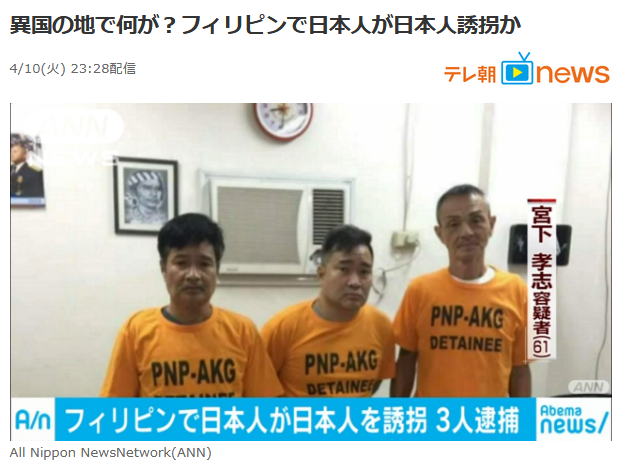 The Philippine National Police's Anti-Kidnapping Group has rescued a Japanese national in Bulacan and arrested his three abductors, including a Japanese fugitive. PNP chief Director General Ronald "Bato" dela Rosa said Japanese Yuji Nakajima was rescued along with a certain Verhel Lumague on April 5 at around 3 p.m. in Plaridel, Bulacan. The 32-year-old Nakajima, a tourist and resident of Higashimukojima, Sumida-ku, Tokyo, Japan was kidnapped on March 22. The suspects identified as Roberto Reyes, Reggie Reyes, and Miyashita Takashi were arrested by AKG operatives after Superintendent Takayashi Nakayama along with three representatives from the Embassy of Japan sought the assistance of the AKG when they received an information regarding the whereabouts of the kidnapper. Takashi, who is also a Japanese national, has a passport that had been canceled on September 11, 2015.